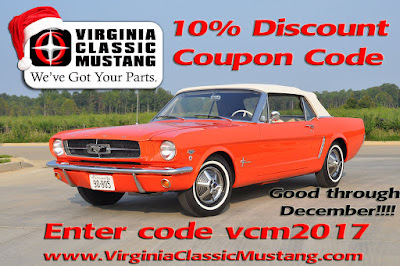 Virginia Classic Mustang Blog: 10% Discount Code Coupon Continues!!! Save on Mustang Parts! 10% Discount Code Coupon Continues!!! Save on Mustang Parts! This sale lasts through December. Order soon though, because it's only good for in stock merchandise. *Gift certificates, data plates, Autolite Batteries, 69 and 70 rear spoilers, certain wheels, special order items, and certain other items are excluded.